Don't take our word for it. 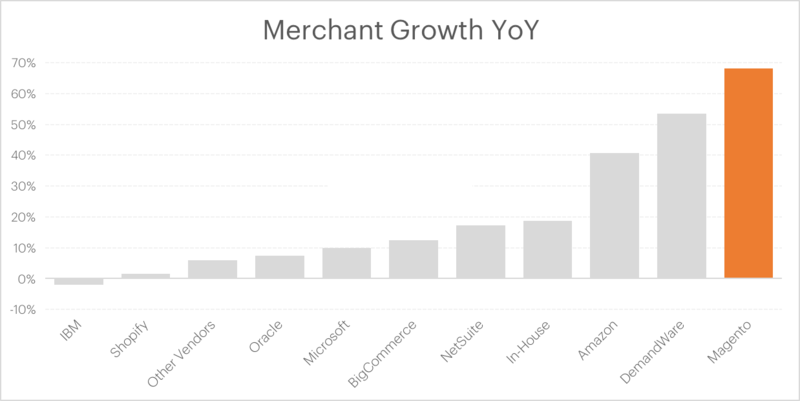 Internet Retailer's 2016 report proves that Magento merchants grow sales 3x faster than IR's Top 1000 ecommerce merchants on average. No other ecommerce solutions offer this speed of sales growth. In year-over-year sales growth, IR's Top 1000 Magento merchants left every other platform in our dust. It's no surprise that Magento is the world's number one ecommerce platform. * Based on Internet Retailer’s 2016 Top 1000 sales data for North America. Custom analysis includes companies using 3rd party ecommerce vendors only, and comparison is based on average merchant sales growth by vendor. Join us, accelerate your growth, and sell more online. Schedule a demo today. Discover how brands like Birchbox and Betabrand boost their sales online and offline. Find out how Magento can create the perfect user experience. Get to market fast with a TCO 50% lower than the rest.